A little while back I brought you news of an all new style Fantasy Football game called Football Trader - a football player trading game akin to the stock market. 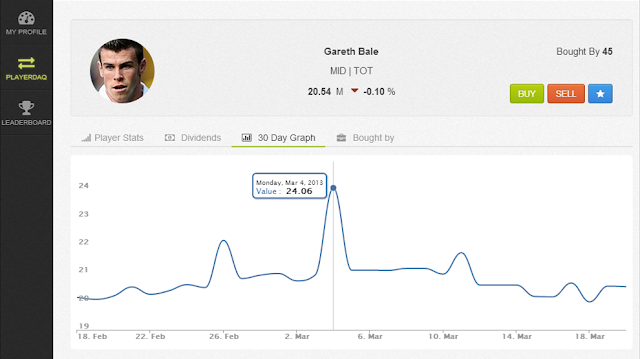 Buy shares in your favourite players, earn divedends for their on-pitch performances, and then sell them for a profit when the time is right. It's Harry Redknapp meets Gordon Gecko and I could not resist this little joke.. Since then and through a period of testing a number of substantial change have beem made to the game, it's performance and feature set. I'll allow the creators of the game @realtime_sports to share the rest with you but it's looking like a really involving, fun and feature rich game. Faster: we’ve completely re-designed the game from the ground up for a much faster experience. Social: follow other traders to keep a track of what trades they are making and see what they are up to. Banter: comment on players and fellow traders, adding your views and banter. Game Levels: work your way up the leaderboard from Rookie Trader to become a Pro Trader. Brag: share your portfolio with the world. Invite your Facebook friends to compete against and brag your scores to. Football Trader is a new type of Fantasy Football game where you Buy & Sell shares in players on a live stock market. Unlike most fantasy football games, this is played in Real-time, meaning the price of players is changing constantly based on users trading on the market and also player performances. Every user starts with £100M budget and the goal of the game is to Grow the Value of your Players, and therefore your Team, as much as you can. You also get Match Dividend Bonus's awarded right after matches, based on how players performed, which are sort of like how you would get Fantasy Points, but in cash! We have had some great success, 500 users from over 20 countries so far in 5 weeks. However, we realised that the performance of the game on mobile was not great, it struggled on some browsers and 3G networks. Also, we were restricted on what changes we could make to the game. For this reason, we have just built a new Facebook web-version of the game which works much faster and cleaner! We still plan to make our mobile app's for the new season as we see this as a mobile game. As it's made for Facebook so it's a lot more Social! You can invite friends to compete against and also brag about your Team Value. Beyond that though you can now follow other users and players like a Twitter feed, which gets included in your news feed. So you can now watch other users and see how they play the game. You can also comment on players and put your view of why their prices are changing. Lastly, all users start off as a Rookie Trader and need to work their way up as a Pro Trader for bragging rights. This will be the start of making the game much more Social we hope.